The original Mirabella V design team getting together to brainstorm on Today’s Mega Ketch 93m Ripple by Rob Doyle Design naval architecture & Van Geest Design. 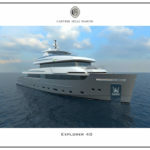 Rob Doyle Design naval architecture and Van Geest Design were colleagues at Ron Holland design studio in Ireland in 1999 when Mirabella V was first sketched. The following Three years the team developed, detailed and sailed what was to be at the time the largest ever composite built sloop. 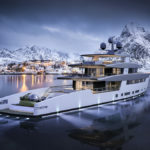 Today looking at the market and recently launched projects, we can see how sailing yachts are now competing with Motor yachts, not only with their increased interior volume, but also on deck lifestyle. However, when these sailing yachts are under sail, a ten degrees heel is scary and control on the sheer size of sails and sheets becomes extreme. But here we remain with a true desire to be close to the water line, with the romantic wish to feel the motion while crossing the ocean. Looking at a simpler way to control sails and a safe family & friendly deck layout, the choice was set on a Ketch rather than a sloop. Working with the sheer volume, closeness to the water and the simplicity in some surrounding natural elements, such as a sand sea bed, cuttle sh bones the team merged and designed together a 93m Ketch performance sailing yacht. The open transom had to offer this unique feel in being one with the amazing surroundings and water line. The exterior navigation is on the sky deck allowing for a 360° visibility and although in an open area, the deck is designed for a good circulation and a secure feel. There are no winches, blocs or sheet handling on sight, by making the yacht safe sailing, the sailing has become automated with a built-in system within the yacht structure. The forward and aft deck areas are fully exploited allowing large gatherings and intimate encounters. The portholes are integrated in the hull stripe. This stripe follows the necessary heights of the interior cabins and widens where the portholes are located. The portholes are not noticeable from the outside and disappear in the design. Accentuating this feature with light gives a unique appearance of the yacht at night. Van Geest Design could not resist in integrating lighting within the yacht architecture but also the rigging itself, creating a surprising lighted area and offering a great open sky atmosphere. The Rob Doyle designed hull package combines a very powerful performance hull with good sea keeping qualities, combining speed and comfort. This is achieved with a wide beamed boat carried well aft, giving a fine angle of entry but still allowing extensive internal volume for a spacious interior layout, coupled with the full-length hull chine that carries the beam far out board to give the best form stability and with a hydrostatic spray rail to keep the wetted surface to a minimum for a given beam. The design stands on experience of around 20 years of designing and building the world’s most advanced aluminium hulls. Rob Doyle Design has been at the cutting edge of this development, having been involved in the design of the world’s largest aluminium sailing hull structure of the 64m Perini Navi Felicita West and later the most technologically advanced aluminium hull of Royal Huisman’s 58m Ethereal, both projects pushing the classi cation societies to new grounds in performance aluminium structures.